↑ For an English translation of Ganesha Purana 1.46, see: Bailey, pp. 258–269. Narain, A. K. "Gaṇeśa: A Protohistory of the Idea and the Icon". Brown, pp. 21–22. ↑ For the derivation of the name and relationship with the gaņas, see: Martin-Dubost. p. 2. ↑ 18.0 18.1 Apte, p. 395. ↑ The word gaņa is interpreted in this metaphysical sense by Bhāskararāya in his commentary on the gaṇeśasahasranāma. See in particular commentary on verse 6 including names Gaṇeśvaraḥ and Gaṇakrīḍaḥ in: Śāstri Khiste 1991, পৃষ্ঠা 7–8. Oka 1913, পৃষ্ঠা 8 for source text of Amarakośa 1.38 as vināyako vighnarājadvaimāturagaṇādhipāḥ - apyekadantaherambalambodaragajānanāḥ. ↑ Y. Krishan (Gaṇeśa:Unravelling an Enigma, p.6): "Pārvati who created an image of Gaṇeśa out of her bodily impurities but which became endowed with life after immersion in the sacred waters of the Gangā. Therefore he is said to have two mothers--Pārvati and Gangā and hence called dvaimātura and also Gāngeya." 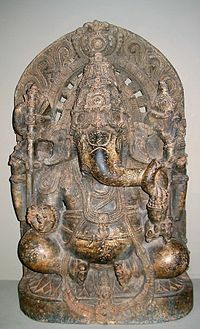 ↑ For Krishan's views on Ganesha's dual nature see his quote: "Gaṇeśa has a dual nature; as Vināyaka, as a grāmadevatā, he is vighnakartā, and as Gaṇeśa he is vighnahartā, a paurāṇic devatā." Krishan, p. viii. ↑ Narain, A. K. "Gaṇeśa: The Idea and the Icon". Brown, p. 25. ↑ Swami Chinmayananda. Glory of Ganesha. (Central Chinmaya Mission Trust: Bombay, 1987). pp. 121-131. Other reprint editions: 1991, 1995. Apte, Vaman Shivram (1965), The Practical Sanskrit Dictionary, প্ৰকাশক Delhi: Motilal Banarsidass Publishers, ISBN 81-208-0567-4 (fourth revised and enlarged edition). Bhattacharyya (Editor), Haridas (1956), The Cultural Heritage of India, প্ৰকাশক Calcutta: The Ramakrishna Mission Institute of Culture Four volumes. Chinmayananda, Swami (1987). Glory of Ganesha. প্ৰকাশক Bombay: Central Chinmaya Mission Trust. Ellawala, H (1969), Social History of Early Ceylon, প্ৰকাশক Colombo: Department of Cultural Affairs . Getty, Alice (1936), Gaņeśa: A Monograph on the Elephant-Faced God (1992 reprint সম্পাদনা), প্ৰকাশক Oxford: Clarendon Press, ISBN 81-215-0377-X . Oka, Krishnaji Govind (1913), The Nāmalingānuśāsana (Amarakosha) of Amarasimha: with the Commentary (Amarakoshodghāṭana) of Kshīrasvāmin, প্ৰকাশক Poona: Law Printing Press, http://ia310939.us.archive.org/1/items/namalinganusasan00amariala/namalinganusasan00amariala.pdf, r কৰা হৈছে: 2007-09-14 . Śāstri Khiste, Baṭukanātha (1991), Gaṇeśasahasranāmastotram: mūla evaṁ srībhāskararāyakṛta ‘khadyota’ vārtika sahita, প্ৰকাশক Vārāṇasī: Prācya Prakāśana . Source text with a commentary by Bhāskararāya in Sanskrit.